Just how harmless are our gaming habits? Are games teaching our brains bad behaviours? Almost all gamers will have tasted that peculiar guilty feeling of having played one hour or level too many at some point. The question is: when does it become a problem? Is it the point when you've not done the dishes for a week? When you've skipped the pub to stay in front of your screen? Or when you die? And there have been deaths. 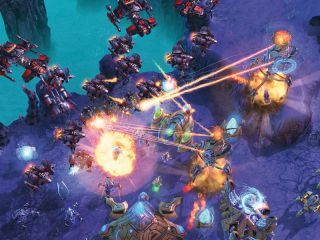 Last year, a Chinese gamer reportedly died of heart failure after fifteen days of heavy gaming in a cybercafe, while a Starcraft player in Korea apparently died after a non-stop fifty hour session. These individuals are part of a growing number of people who have managed to play themselves to death. And unfortunately, deaths mean sensationalism. Tabloid headlines gorge themselves on this kind of stuff. These tragic events are just a handful of instances among millions, perhaps billions, of gaming lives, but they're easily exploded out of all proportion by the hype-seeking missile of cheap journalism. Indeed, the menace of gaming is a spectre whose true shape is unclear. We really don't know much about long-term gaming, or what it might be doing to us. And we'd argue it's this lack of clarity that's actually our biggest enemy; ignorance about habitual gaming is now a major issue for gamers, and for society at large. On the one hand, we're seeing reputable British newspapers unquestioningly – and unhelpfully – reporting that playing games is akin to being on drugs. On the other hand, we're seeing very little being done to figure out what games mean for human lives. But that can't last forever – sorting the facts from the fiction, the lies and hysteria from the genuine problems is going to be a crucial task in a world where gaming is fast becoming the dominant leisure pastime. We should make two things clear at this point. Firstly, there is no professional agreement on the status or nature of videogame addiction. Contradictory studies and reports have been published and there has not yet been an accepted official diagnosis of the condition in the UK or North America. What nearly all medical professionals do agree on, though, is that there has not yet been suitable research into the subject. Secondly, excessive use of videogames is hurting people. There are many self-proclaimed addicts, and plenty of incidents of excessive gaming where people's relationships, working lives and health have suffered. Some, albeit it astoundingly rarely, have even died. So, it's undeniable that there are problems related to over-use of games. But whether this constitutes addiction, in the sense that a heroin addict or alcoholic is addicted, is where the problem lies for ongoing research. Thus what we are faced with is a subject that has not been suitably researched in a climate of fear about addiction. Our jumpy response to that word can cause us to attribute addiction to almost any habitual activity. So, let's take a look at what we do know. Over the following pages, we'll talk to an expert in the subject of habitual gaming, examine what addiction might really mean in the context of gaming and look at what the potential physical effects of prolonged exposure to videogames could be. The idea of videogame addiction has been misshapen by the way that studies trying to identify and understand the problem of obsessive videogame use have been undertaken. Many psychology studies are simply phone or internet interviews, and they often try to apply criteria for gambling addiction – a related, and yet clearly very different problem – to gamers. These studies also rely on impersonal surveys of large numbers of randomly selected gamers, rather than talking to individuals – a risky tactic that can skew results by asking the wrong questions. To understand this problem better, we talked to Neils Clark, the author of the recently published Game Addiction: The Experience and the Effects, and questioned him about the lack of useful data. "There are a lot of problems with the numbers that are being thrown out there," says Clark, "huge problems with how we are getting data on game use and gaming behaviour. The questions that researchers ask don't necessarily consider how we play these games. "One of the flags for addiction was the question: 'do you think about the game when you are not playing? ', which of course you do if it's an involving MMO. Of course you'll be preoccupied if there's some guild drama going on or something. A phone survey is probably going to throw up results that are not useful in making a diagnosis. They conflate normal play activities with addiction and that's going to produce gibberish." And gibberish can be dangerous. Talk of videogame addiction frightens people, especially when gaming is so widespread, and it can even cause gamers to doubt themselves when they really don't have a problem at all. "Some people are being mislabelled addicts by concerned parents, partners or others when they have no problems with their game-playing behaviour… Some people who are concerned about their own behaviour… end up labelling themselves as video game addicts." So, gamers are panicking and then self-applying this label, when in reality their behaviour bears few of the hallmarks of genuine addiction. Current page: Does gaming addiction exist?